In the previous post we introduced Mojo. Today we’re going to take a closer look at how it all fits together. This tells Mojo that it needs to run a collect step, to gather resources (charms, and maybe other build artifacts), followed by a repo step to create the juju repository for deployment from the resources it downloaded in the collect step, followed by a build then deploy step and then a verify step. The details of what those specific steps involve will be defined in a directory with a name that matches the --stage option that we pass to the mojo run command. => collect resources as defined in "devel/collect"
=> create charm repository as defined in "devel/repo"
=> run custom build commands per "devel/build"
=> deploy using "juju deployer -c devel/services-and-relations"
=> collect resources as defined in "production/collect"
=> create charm repository as defined in "production/repo"
=> run custom build commands per "production/build"
=> deploy using "juju deployer -c production/services-and-relations"
The differences between the production and devel might be in the number of instances or the machine constraints you want for each service, for example. By minimising the differences between these “stages”, but also making them directly visible in the specification branch, you allow developers and sysadmins to deploy and test services in exactly the same way, which makes for a much more repeatable process. Mojo also includes some helper scripts for integrating it with Jenkins so that you can set up a means of kicking off Mojo for as many different services as you like. 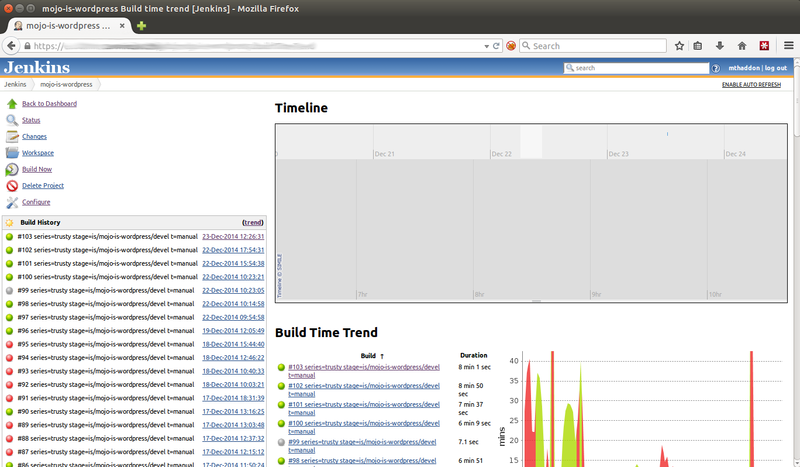 At Canonical we have Jenkins set up to deploy Mojo configured jobs into our production OpenStack instance so that we can verify particular specifications for services run by developers will work in our production cloud. This allows us to discover problems before they get to staging or production due to, for instance, egress firewalling on our production cloud which might not have been the case in the Juju environment developers were testing in. Each job in Jenkins will spin up a new Juju environment, deploy the entire service stack and run anything else defined in the manifest, including any verification steps. The examples so far describe using Mojo to deploy an entire service from an empty Juju environment, albeit one that has been bootstrapped. But that’s not the only thing you can use Mojo for. Let’s look at how you would use Mojo to manage service upgrades. What this means is that we’d deploy the service as normal, per the original lines in the manifest file, then we’d run the lines from the manifest-content-upgrade “sub-manifest”, which would run our juju set, sleep for 60 seconds to allow the service updates to happen, and then run the verify command to ensure the service is responding as expected after the update. Why did we separate out this upgrade into a separate manifest file, and include it into main manifest rather than just putting those steps directly into the main manifest file? Because doing so allows us to run mojo run --manifest-file manifest-content-update which will only run the steps to update the content of the service, so we can run this command in isolation on production, once we’ve verified that it’ll work as expected from having run it as part of our end-to-end test that brought up the entire service and then did the content update when we ran mojo run. 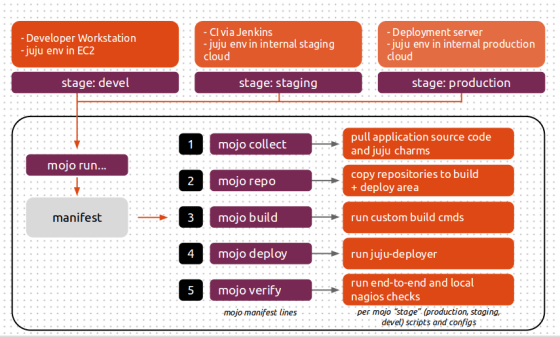 In this article we’ve taken a look at Mojo manifests, we’ve seen how “stages” can be used to vary deployments in different environments such as development or production, we’ve seen how Mojo can be used with Jenkins to provide CI and we’ve talked about how it can be used to run service updates on existing Juju environments. Next time we’ll walk through the exact steps of an example deployment so you can see how Mojo works for yourself. 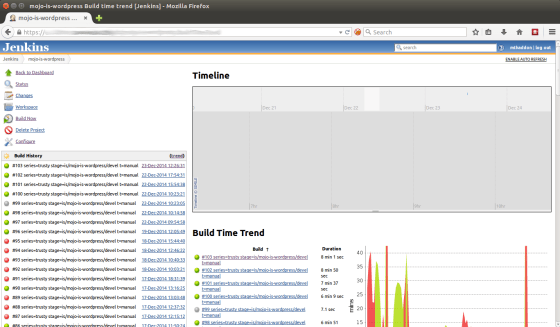 Tom Haddon is a squad lead within Canonical’s IS department. He manages a globally distributed team of senior systems administrators rotating between three functions: Projects, Operations and Webops (devops). He has a strong focus on cloud technologies including OpenStack, Juju and MAAS.